Backups of your computer’s files have to be trustworthy. If you can’t trust your backups, they’re not really backups. 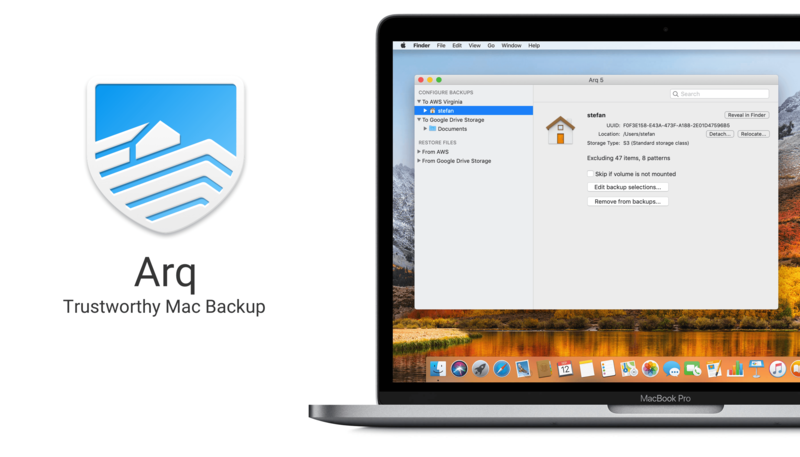 The reason Stefan created Arq Backup for the Mac back in 2009 was because he couldn’t find an online solution that felt like real backup. Most online backup providers were and continue to be vague about where the data are stored, how durable the storage is, and how sustainable the business model is. Arq does everything it can to provide a completely trustworthy backup solution. Why should you trust Arq? Arq is open. It stores versioned, de-duplicated backup records in a format that’s documented. Arq is private. Backup records are encrypted with a password that only you know. The password never leaves your computer, and your data is encrypted before ever leaving your computer. Arq gives you control. Your backup data is stored in your own cloud account, SFTP server, or NAS. Arq verifies. Arq periodically makes sure the contents of the objects at the destination match the contents of your files on disk. Arq notifies. You’ll get a notification when there’s an error. Do you like having total control over your data? Do you want to maintain your privacy? Then Arq is for you! Download a free 30-day trial of Arq today and rest easy knowing that your files are backed up and secure. Our thanks to Arq for sponsoring MacStories this week.